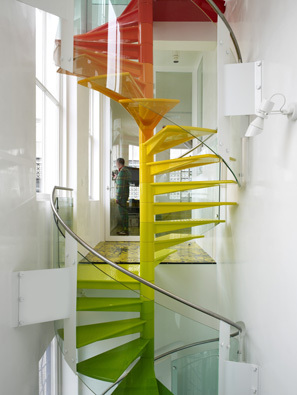 I suspect that if your architect suggested a rainbow staircase, an internal curly slide and floors patterned with huge yellow and black daisies you would simply have to trust their ‘vision’. To truly appreciate London’s remarkable Rainbow House, designed by Ab Rogers Design, watch the video clip below – every aspect of the house is truly stunning. 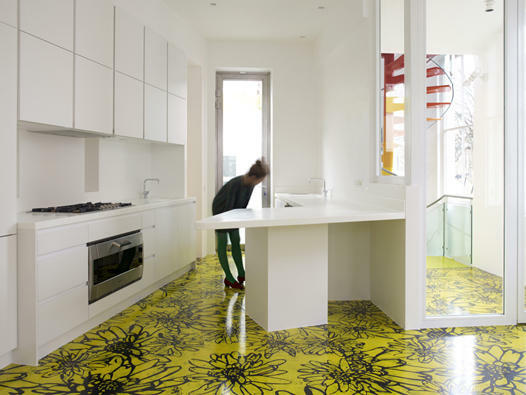 The faux-floorboards, the use of bright colours and the jungle-themed wallpaper are just some of the details that give this house a cartoon-like quality. There’s also a rotating bed (so that you can look out any window), a trap door leading to the slide and a divine yellow ‘sofa piazza’. And then of course, there’s that amazing staircase. 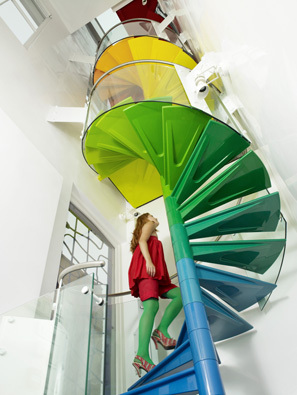 The colours of the staircase create “… a visual rhythm on a vertical axis.” Stunning.